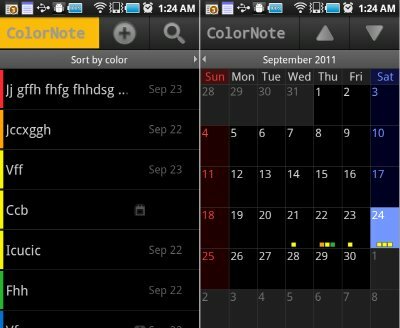 ColorNote BackUp & Sync : How to transfer notes from old phone to new phone. How to sync notes between phone and tablet. About Sync : When you sync on the phone, it sync notes with ColorNote Online Service. You can sync notes between phone and tablet or you can restore notes on the new phone. We will support PC client later. 5. Tap backup item you want to restore - Type password that you have set when backup file was created. 1. Just sign in online sync with same account on your new phone. + If you didn't signed up online sync. 3. Tap backup item you want to restore - Type password that you have set when backup file was created. 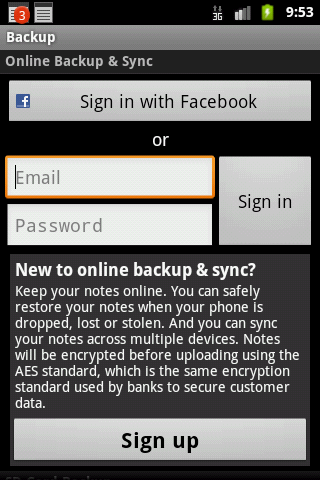 + Try to restore notes like when you don't have old phone. + You cannot find backup menu and you can see sync menu only. + Or you cannot see 'Restore' option when you click backed up data. There are only View and Delete. 3. Now you can see backup menu on the main screen. Try to restore notes from sdcard. 4. Sign in online sync again. + You cannot find backup file list on your sdcard. 3. Sign in online sync in your tablet. 4. Sync on your tablet. Version 3 update is now available on Android Market and will be updated soon on amazon appstore.